Talk to Your Teen During National Teen Driver Safety Week | Hupy and Abraham, S.C.
October 21 – 27, 2018, is National Teen Driver Safety Week. Motor vehicle crashes are the leading cause of death for teens aged 15-18. The United States Department of Transportation reports that just fewer than 2,000 teen drivers died in crashes during 2015, the most recent year for which data is currently available. Just fewer than 100,000 teen drivers were hurt in crashes. Accordingly, the United States Department of Transportation is urging parents to use National Teen Driver Safety Week—and every week—to talk to their kids about staying safe behind the wheel. The dangers of drinking and driving. Drunk driving is still a leading cause of deadly accidents in the United States. In Iowa, as in other states, it is against the law for a driver under the age of 21 to drive after drinking any amount of alcohol. The dangers of speeding. In 2016, the most recent year for which data is available, 224 people lost their lives because of speeding or aggressive drivers in Iowa. Many more people were injured. The importance of wearing a seat belt. In 2016, the most recent year for which data is available, 116 people lost their lives and many more people were injured because they failed to wear a seat belt. A review of Iowa’s graduated license law. Drivers under the age of 18 must comply with Iowa’s graduated driver’s license law. Before they will qualify for a full and unrestricted driver’s license, they may qualify for an intermediate license. If your child has an intermediate license then he may drive alone, but he may not drive without adult supervision between 12:30 a.m. and 5 a.m., he may not use a cell phone or electronics while driving, and he must comply with the law’s passenger restrictions. Of course, you should also include any safety topics that are unique to your child, such as a dangerous turn near your home or a certain traffic pattern on the way home from school. Explaining your rules for driving clearly and calmly. Attaching consequences, such as loss of driving privileges, for any violation of the rules. Being specific in your instructions. Talking at a time that your child is willing to listen. It can be very difficult to let your teenager become a driver. 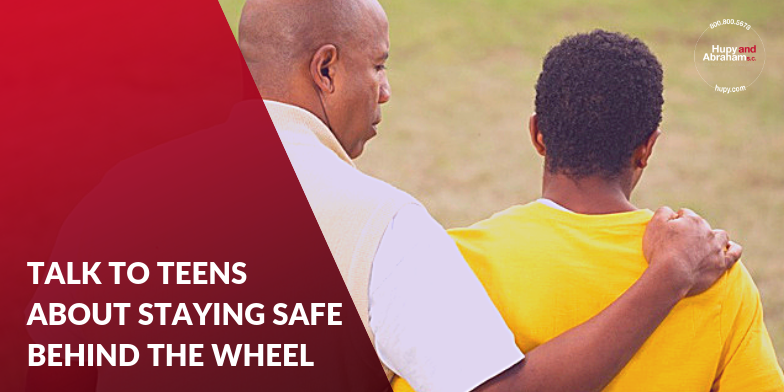 Given the statistics and the significant risk of injury, you are right to be scared. However, you can’t let that fear interfere with how you communicate with your child. Instead, cover the important topics in a way that requires your child to really hear you so that your child is safe on the road not only during National Teen Driver Safety Week, but also during every week of the year.